I have a confession to make: I’m having a love affair with whole cloth quilts. This passion snuck up on me, quietly whispering, “let’s see what you can do with this cloth”, “what would these threads look like on Radiance”, “did you see that thread?” Wide open spaces get me all giddy thinking about the possibilities. Whole cloth quilts have taken over my quilting. Any cloth will do add bamboo, wool or silk batting, with miles of colorful thread stitched over the surface creating one of a kind designs. I found it difficult to give into the yearnings to just quilt with so many unfinished quilts on the shelf until Melly Testa asked me the all important question, “what is this obsession with finishing?” With this new found freedom along came “Twilight in the Bronx” the first in a series of whole cloth quilts named after the New York City. 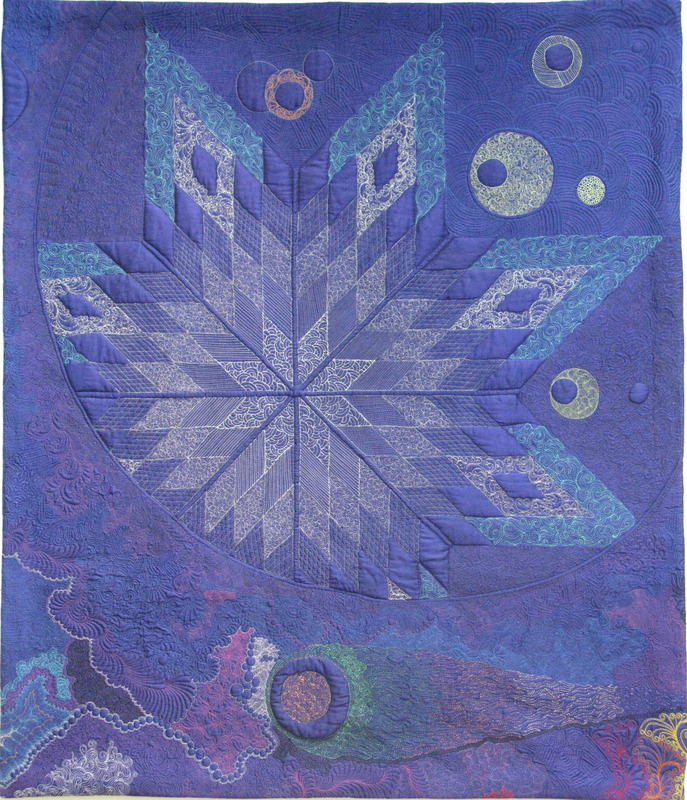 Whole cloth quilts have long been a way for quilters to show their quilting prowess. Whether by hand or machine whole cloth work carries a certain mystique, rich in symbolism and tradition. The images used reflected the area of origin. Whole cloth quilting, trapunto, boutis and matelasse have their roots in Italy and France and came to the US through England during the colonial period. 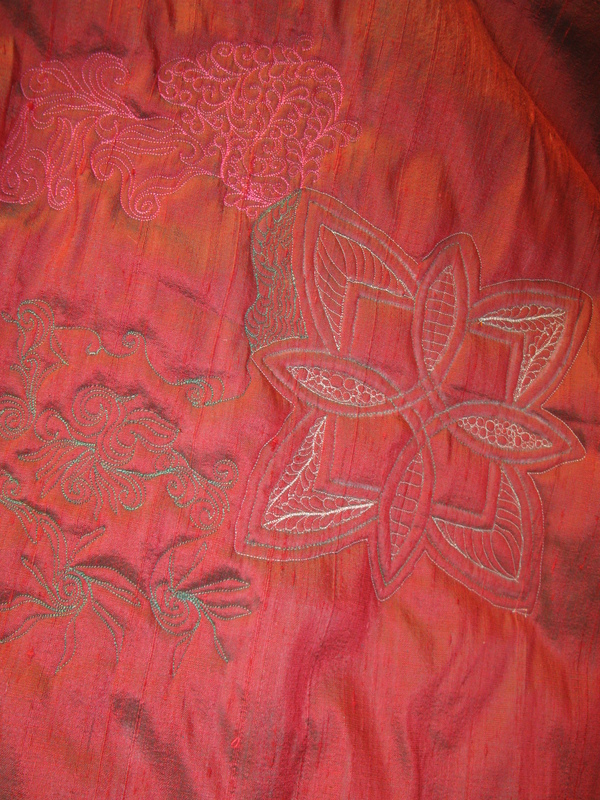 Generally whole cloth quilts were white stitched out on white cotton however many were stitched on colored cloth and were generally tone on tone. Quilters used cotton, wool or silk depending on availability and the specialness of the occasion. Whole cloth work even makes an appearance in feminine fashion in the form of petticoats with an opening in the skirt to revealing the detailed work of the petticoat. I’ve seen amazing examples of these petticoats on display at the Wadsworth Athaneum in Hartford, CT. Many quilters still embrace traditional whole cloth quilting in white or tone on tone coloration. These quilts and textiles, whether hand or machine quilted, add to the beauty of the quilting world attesting to the skill and artistry of the quilt maker. Like pieced quilts whole cloth quilts take thought, preparation and skill to create. Diane Guaduynski, Karen McTavish and Sue McCarty have all created award winning, beautiful, tradition honoring whole cloth quilts. Each one of these quilters has created masterpiece whole cloth quilts with Diane earning the title of “Master Quilter” from the National Quilt Association. Personally I am in awe of their work as quilters and as teachers. There are many quilters who are approaching whole cloth in a different way, incorporating a wide variety of background fabrics, thread weight, color and batting choices. Sue McCarty’s Tribute to Tolkein is an amazing example of contemporary whole cloth quilting using mostly metallic thread to create the intricately detailed wedding scene. Sue Patten comes to mind with her ZenSuedle quilts and classes. 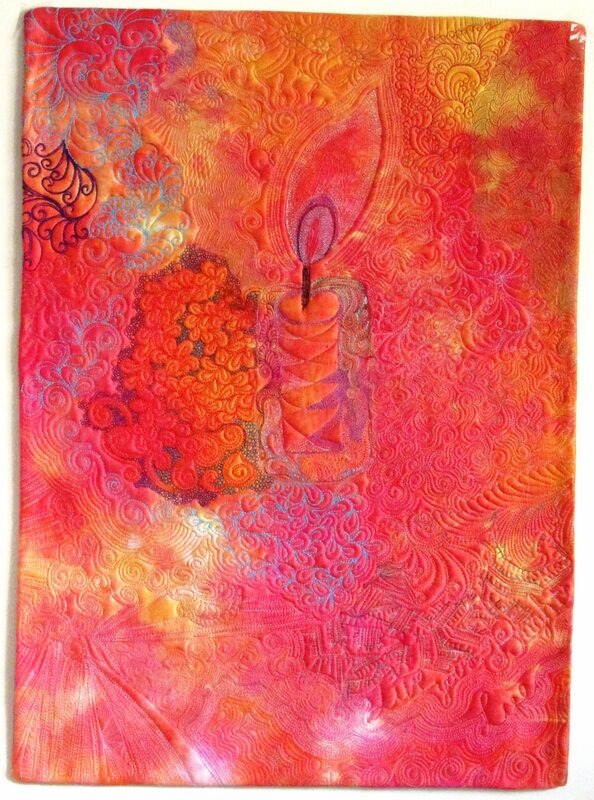 From Sue’s website I create “continuous line, designs and fillers to create your own one of a kind ZenSuedle whole cloth quilt”. Every type and style of quilting has a process, a way of doing things that is needed for a well made quilt. Learning each skill, from choosing fabrics to binding, takes time to learn and become proficient. Each quilter over time takes those learned skills and makes them their own, finding which styles, tools and processes work best for the style of quilting they love. Whole cloth quilting is no different in that regard, the skills focus on design and the quilting. The next few paragraphs cover practice, inspiration, decisions, and choices for batting, batting thread and binding. It is important to note that your process may be different and I wholeheartedly give you permission to figure out your style. “Don’t worry that it’s not good enough for anyone else to hear, just sing….sing a song” Just quilt, quilt your heart out! There’s no getting around the dreaded “p” word – practice. When I need to figure out the stitching path of a new to me quilting motif I take pen or pencils to paper and spend time working out the stitching path. I do this both right and left handed as I machine quilt with both hands. As I’m practicing other designs, complimentary motifs will crop up; I call this process “mindful practice”. I have sketchbooks filled with these images that inspire new whole cloth quilts. When thinking through a whole cloth quilt the designs are focused and intentional. Or not. Different colors and line thicknesses will help get the idea of what the quilt will look like when it’s finished. Using pencils with erasers offers the opportunity of changing things up prior to sitting down and stitching. This type of practice gets the creative juices flowing, like stretching before exercising. I wish that complete quilting ideas would pop into my head with a clear understanding of motif and color placement. Ideas develop slowly, like making sour dough bread. The starter must be maintained and fed several days prior to use so that the old sour is replaced, yeast has time to develop and flavors the new ingredients. Once the sour is ready for use the next step is to leaven the bread being made from the sour. The end result is well worth the effort – the aroma filling the house and tasting the bread fresh from the oven! The design process for a whole cloth quilt (any quilt) is the same way, it takes time to develop from inspiration (sour starter) to finished quilt top (tasting the bread). Inspiration presents itself in a multitude of ways; a piece of fabric, wrought iron, the moon, traditional piecing patterns, flowers, trees and the list goes on. When I’m out and about I keep my camera with me to capture images that inspire. As I take the image I’m mentally trying to think through the stitching process. I usually have a sketchbook, sharpie pens or color pencils at hand to try out these new to me motifs. 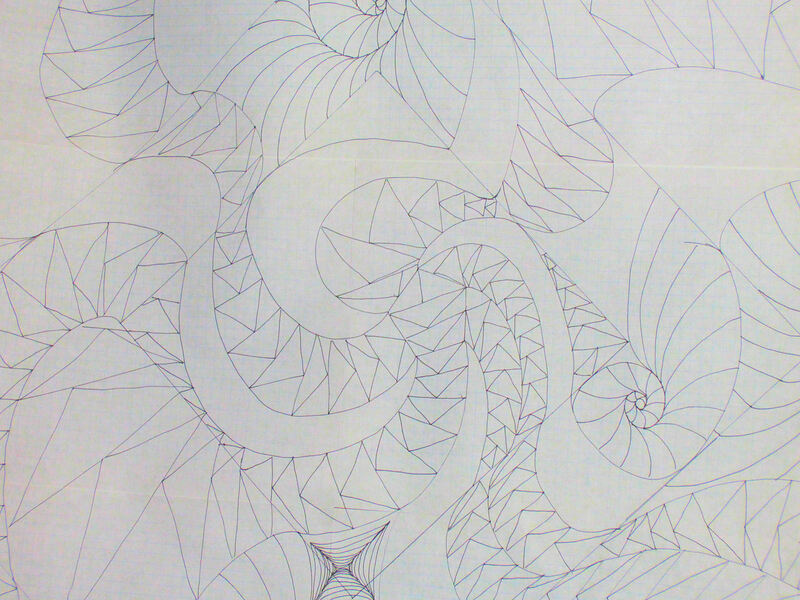 At a quilting retreat an image of a nautilus shell caught my attention, the spiral shape and connections set me wondering how this could be stitched out. Looking through the sketchbooks this shape became a recurring them in my doodling and has worked into my quilting. Oh the moon, the beautiful moon with its bright, reflective light. Infrequently I can see the moon from my office window which faces toward Manhattan. I needed an idea for a quilt, the next in the “City” series. I knew I wanted to keep the eight pointed star from “Twilight in the Bronx” but the next part eluded me. One morning from my office window the moon hung so low in the horizon it appeared to be resting on the tips of the Manhattan skyline. In a moment I knew what this quilt would look like, its name, “Moon Over Manhattan” and the star would be stitched out in shades of gray with several star points being obscured by the curve of the moon. Sometimes inspiration comes from a thought or word. A friend mentioned the word spiral and several ideas popped into my head. From this one word and a set size @play (recently published in Machine Quilting Unlimited) came to be. With any quilt we all go through a decision making process including: end use of the quilt, size of the finished quilt, cloth and batting. Knowing that each decision will effect the overall look of the quilt, oh heck, seriously I just wing it. Size is based on width the cloth; batting whatever I have on hand and thread, a well stocked stash lends itself to greater creativity. 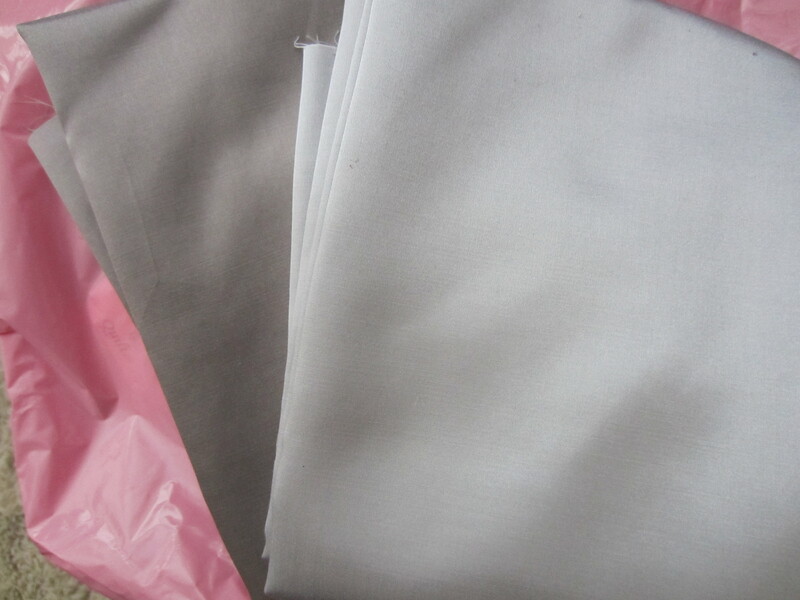 I have cotton, polyester, bamboo, wool and silk on hand so there are plenty of options. A small piece like this provides a great opportunity to experiment with batting, learning what the batting will do in the quilt, how the loft affects the look of the quilt and which battings provide structure and which provide loft. An aside about batting: if it comes from a plant (cotton, bamboo, soy) it’s flat and has a memory; if it comes from an animal (worms, sheep, alpaca) it’s fluffy and doesn’t have a memory. With polyester all bets are off it can be flat or fluffy because the companies can do anything with the fiber. The polyester is meant for another quilt, so no poly. Bamboo will provide structure; it has a memory similar to cotton. Wool will provide structure; has a loft and has no memory. Silk provides structure, loft and has no memory. We all know that when cotton is folded and hand pressed the line can be seen, and a quilt with cotton batting that is folded will retain those lines even when it’s hung even for long periods of time. Neither wool nor silk have memory so when a quilt has been folded for a while and is hung the fold lines will ease out from the weight of the quilt. For quilts where structure is important use two layers of battings in the quilt, this is particularly useful in quilts intended for competition as it is more likely that the interlocking of the stitches will remain in the batting rather than showing on the top or back of the quilt. It’s important to pair needles and thread for good, quality stitches. If the thread is too large for the needle the thread will bounce and skipped stitches will happen. If the thread is too small for the needle a larger than necessary hole will be left and pin dotting may occur looking as though you’re having a tension problem. Rule of thumb: when using a heavy thread use a large needle; fine thread use a smaller needle. Expect to adjust the tension of your machine: machine tension is set to 60 weight polyester used for garment making, this is a fine thread. 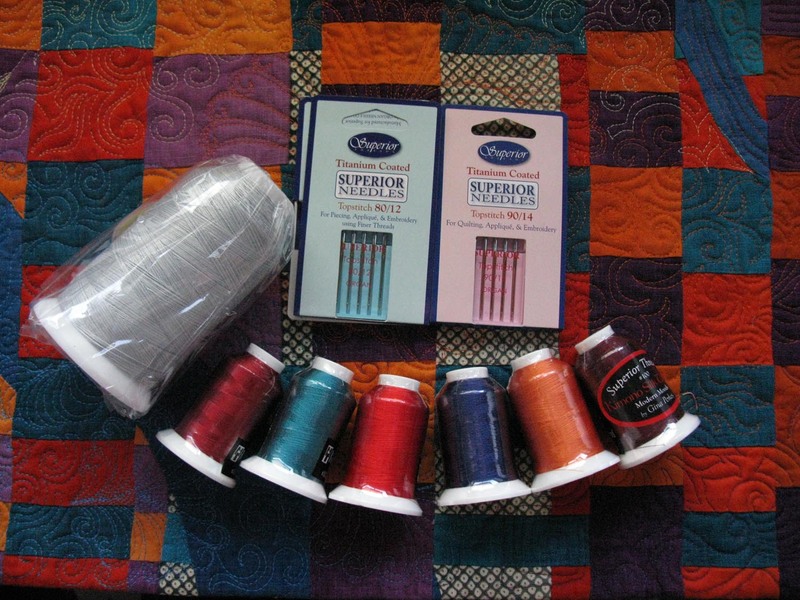 Most of the thread used in quilting is much heavier and may require tension adjustments, usually reducing the tension whether on the top or in the bobbin. Even if a home sewing machine has self adjusting tension it’s important to understand that in the quilting process tension adjustments will be necessary. If the manufacturers didn’t want us adjusting tension there wouldn’t be any way for the tension to be adjusted on the machine and there is only 1 machine that I’ve ever seen that did not have some way to adjust the tension, and it needed it. There are so many good tools available for marking quilt tops. Always mark the quilt before its basted unless using some kind of paper product or loose chalk powder which allows you to mark as you’re quilting. As a general personal rule I use chalk pencils however sometimes the markings don’t show or remove too easily with my hot hands, in this case I use some type of washable or heat removable marker. There may be issues with the ink type marking pens, particularly if the quilt is basted when marking. Try a variety, do a little bit of research and see what quilters are saying and find what works for you. What do I mark you may be asking? You might (not) be surprised to learn, as little as possible. With each of the quilts mentioned already I marked the underlying structure. For “Twilight in the Bronx” and “Moon Over Manhattan” that means the star and circle; “@play” I drafted on huge sheets of paper, placed the paper under the fabric and drew in the spirals (not the nautilus) and the flying geese. That’s it. Now that the planning is done and the quilt is marked it’s time to stitch your quilt. This is where the fun begins. Relax your shoulders, breathe, blink and enjoy the process of creating a small whole cloth quilt that reflects your style and color choices. Don’t let a small whole cloth quilt fool you they take hours and hours to get quilted. Slow down and enjoy the process. If something isn’t working remember that “a seam ripper is a quilters best friend”, take the stitches out. Take this time to ponder what’s working and what’s not working and make some simple changes. Being willing to listen to the quilt and make changes as you’re going along will work better than trying to stick to a “set plan”. 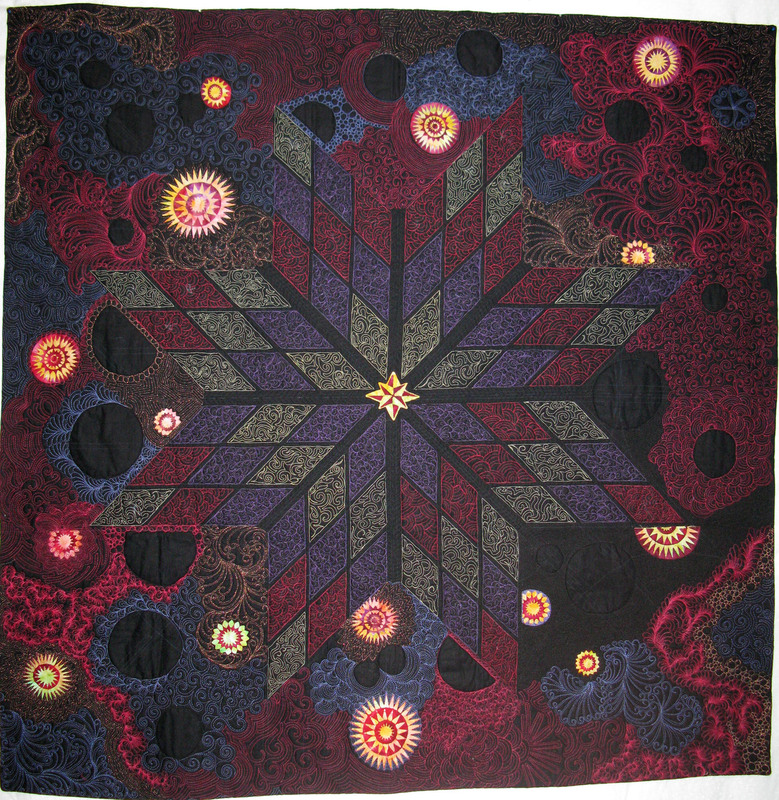 When quilting Twilight in the Bronx, Moon Over Manhattan and @play I listed to both internal (my own thought process) and external voices (friends in one of my mini-groups) and made changes for the better on both quilts. With so much stitching it may be necessary to block your quilt. Blocking is a process where the quilt is wetted, pinned to carpet or covered foam insulation sheets so that the quilt is square (use a measuring tape, ruler and t-pins) and dried. It’s best to run fans over the surface of the quilt to aid the drying process. With a small quilt pinning to your design wall or over sized ironing board and letting it dry will work. There are some great tutorials for this. Once the quilt is blocked it’s time to give consideration to finishing the quilt. Before making a decision on how to treat the edge of the quilt take a photo to gain some perspective, distance from the quilt. Does the quilt need the binding to look complete? If the answer is yes a traditional binding can frame a small quilt beautifully giving the quilt a visual stopping point. If the answer is no, then “facing”, the binding is pulled to the back of the quilt, is the better option. Facing will visually extend the lines of the quilt giving as much visual impact as a traditional binding. Facing is easy and there are a few great tutorials on line. If you’ve decided this quilt will be hung on a wall this is the point to add a sleeve, remember to give consideration to the depth of the rod this will be hung on and allow for that in cutting and stitching the sleeve. If this is meant for competition, check the rules of the show for their requirements. It’s time to just enjoy your finished whole cloth quilt. That’s right just sit back and enjoy your quilt. Post photos on your blog or on facebook and let us enjoy your quilt too. thank you for a wonderful, informative post. I am constantly dreaming of wholecloth quilts – now is the time to just do it! Thanks also for passing along the comment about the obsession with finishing – I need to relax my attitude on that! You’re welcome. Go ahead and make that whole cloth. Have fun and enjoy! I am so thankful for your timely post. Of late, my mind has be swirling with whole cloth ideas…..whether the cloth is a solid or an heirloom printed tablecloth, etc. I have had many thoughts on the differences of battings and you have helped so much in that area!!!! Thank you!!!!! Hugs……. You’re welcome. Feel free to contact me if you have any more questions.